How do I create a system restore point before repairs are carried out? PC Reviver conveniently creates a System Restore point on your computer, before any repairs, optimization or changes are carried out. A system restore point enables you to undo recent changes and restore your computer to a previous date and time. This is especially helpful when recent changes or repairs have an undesired effect on your computer and you wish to roll back all changes. The Create System Restore Point Before Optimizing option is available under the Settings area of PC Reviver and is enabled by default. You can turn it on or off by clicking the switch. 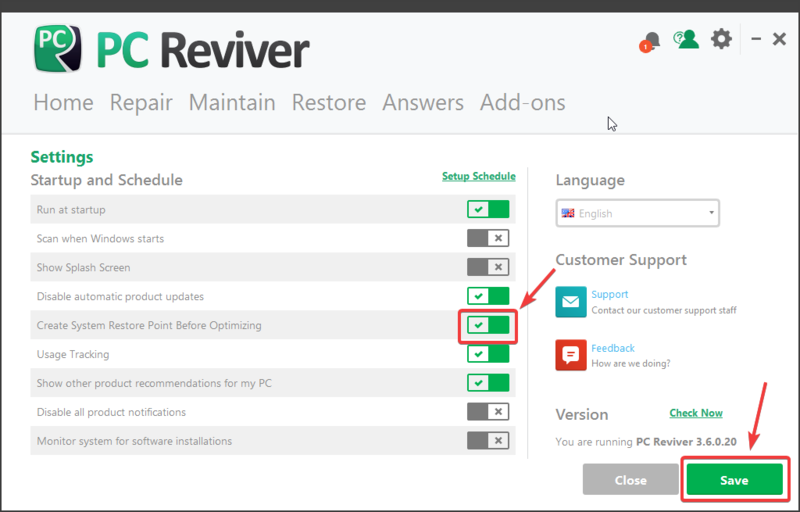 How do I cancel my subscription for PC Reviver? How do I maintain my PC using PC Reviver? How do I activate or register PC Reviver on my computer?